Just when you think you’ve licked your addiction, a day like yesterday comes along and Twitter gives gives gives and then gives some more, like a broken slot machine. Mark and I were recovering from a rich dinner and slightly queasy new episode of Girls when I checked my phone one last time and whoa. If you know what I’m talking about, great. If not, go read a newspaper! Today I met someone who had no idea what was going on in the world and while this is often sane and refreshing, sometimes I want to say: Dude, you are missing out. Anyway, I didn’t sleep well after several hours of Don Lemon and Twitter, but in fact the insomnia had more to do with the rich dinner I served than the news. Pivoting now to cooking. As cookbook lovers know, Food52 announced its 2017 Piglet finalists yesterday. I own several of the titles (Koreatown, Deep Run Roots, Dorie’s Cookies), know something about a few others (Simple, Sirocco), and hadn’t heard of most the rest. At the library, Naomi Pomeroy’s Taste & Technique was on the new arrivals shelf so I grabbed it. 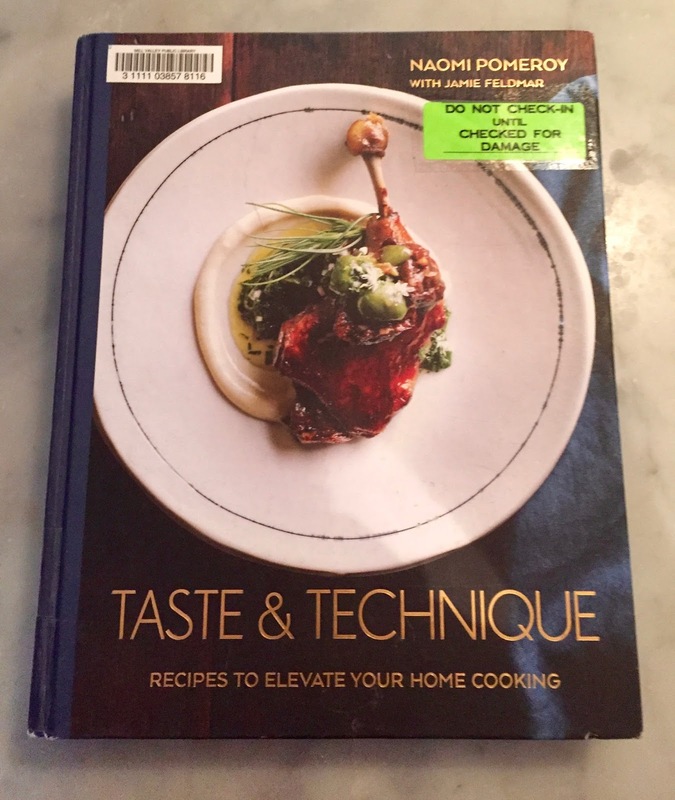 This handsome book will teach you to make aioli, braise short ribs, and saute kale, presumably, hopefully with better results than ever before. After flipping through the book a couple times, I was respectful, if not bubbling over with enthusiasm. After cooking a meal from its pages, I am respectful and more enthusiastic, if not bubbling over. It takes a lot to get me bubbling these days. The meal I cooked: pan-roasted salmon and long-cooked green beans. Here’s what went on my grocery list: salmon and green beans. It’s that kind of cookbook. 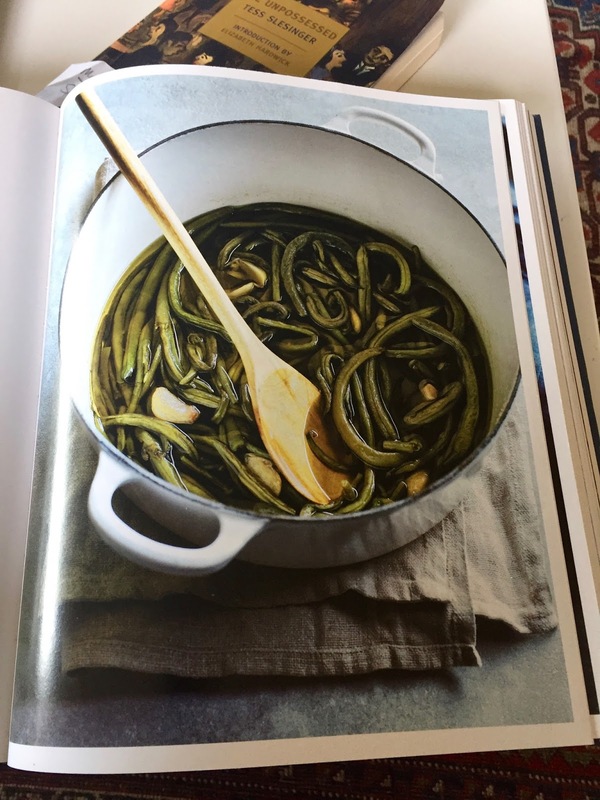 To make the vegetable, you immerse trimmed green beans in a pint (!) of warm olive oil and let them simmer very gently for an hour or so until they’re drab and almost falling apart. 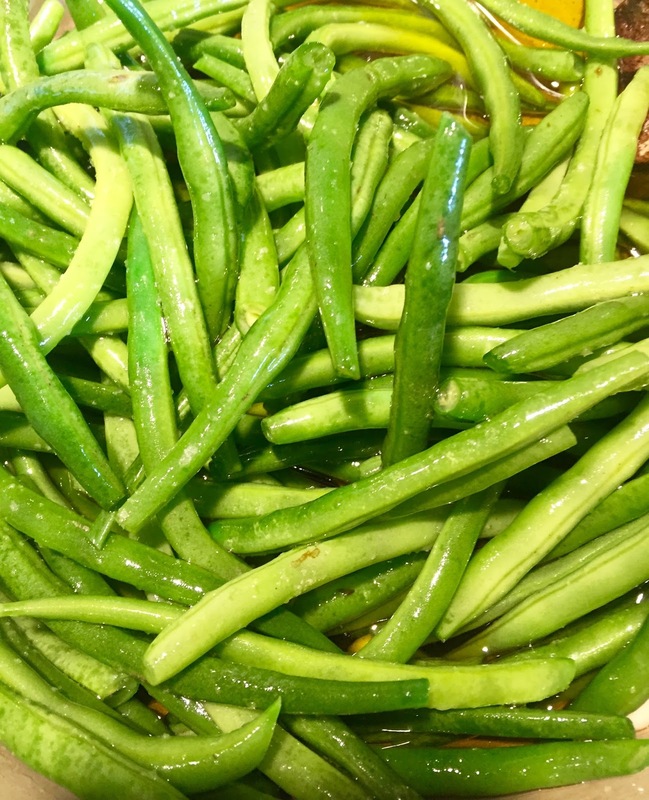 I thought I didn’t like overcooked green beans, but it turns out I do. They required a lot more salt than the recipe indicated and a slightly longer cooking time, but otherwise the recipe was flawless and the beans very, very good. I may re-use some of the oil to try the long-cooked broccoli variation. The salmon was even better. The salmon was sensational. Probably the best technique I’ve tried for cooking salmon, and I’ve tried plenty. You season your salmon filet then sear, skin-side down, in a hot, oiled skillet for three minutes. Melt a hunk of butter in the pan, baste the top of your fish, pop in the oven for a few minutes, baste some more, and serve. You could add lemon and capers to the butter, I suppose, but it was delicious as was. 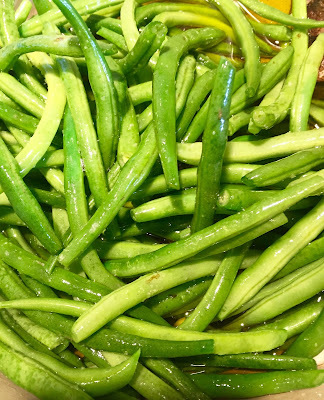 My one qualm: It was superrich, particularly when served with green beans poached in a pint of olive oil. But we loved this salmon, loved this meal, and I have already decided what dishes to try on Thursday and Friday nights. Today I put the leftover salmon into a green salad dressed with the cacao nib vinaigrette from Alton Brown’s EveryDayCook. Salmon and chocolate vinaigrette? I know. But it was fine. I made the dressing a few days ago and have used it on several salads with lovely results. You grind some cacao nibs, infuse into olive oil over low heat, mix with shallots and balsamic, and end up with a unique and tasty vinaigrette that would work especially well, I think, on a salad of spring greens, fresh cherries, and cheese. But it worked great on salmon salad, too. *The fudgy mocha brownies from Dorie’s Cookies overwhelmed me. Too tall, too bulky, too nutty, too much chocolate, too much coffee. I served these bruisers to my in-laws, who are chocolate fiends, unlike me, and even they approached them cautiously. Not a fail, but I wouldn’t make them again. *The narrative of villainy and greed that unfolds in Jane Mayer’s Dark Money beggars belief. I had taken it on faith that the Koch brothers were evil because that’s what the people I respect and the news media I follow always said. But I couldn’t have told you why the Kochs were awful; I would have muttered something vague and tried to change the subject. I’m only on disc 7 of this audiobook, but I can now tell you why the Koch brothers are terrible in gruesome detail. The narrator mispronounces a word every ten minutes or so, but otherwise does a great job with this informative and enraging book. I am abjectly grateful to anyone who has given the last seven minutes of their own irreplaceable life to allowing my voice, thoughts, and imaginings into their head. Yes, yesterday was a day that I couldn't ignore either! All chaos, all the time, and a bit disturbing, although I am trying to come to peace with the fact that I am somewhat powerless to change the track for this train. I do what I can, then I go to the gym to work it off. I am completely intrigued by cooking beans in oil! I will have to try this. As a southerner, I add olive oil or butter to beans when/after I cook them as a seasoning, but never in such gross quantity. Did they taste oily? Did you use a good olive oil? I immediately went the library website to see if my library had it. Nope. I will have to mull it over as to whether or not to buy. I generally am most intrigued by cooking techniques rather than variations of recipes. I think this is where really good cooks reveal themselves. I am pretty much overwhelmed by people who thank me for my time. The first time Jose Diaz-Belart said, "thank you for the privilege of your time" on NBC news, I was surprised and thoughtful. But I truly appreciated his sentiment. After all, time is what life it made of; it is precious whether we recognize it or not. It's always, and I mean this sincerely, always a pleasure to spend time with you. And I appreciate more than I can say how much I enjoy each and every post. So, thank you, Jennifer. I've spent hours of my life reading your blog, i.e., allowing your voice, thoughts, and imaginings into my head. Looking forward to Piglet commentary. As usual I think their judges will be controversial. I'm very curious about Deep Run Roots and would love to read your reports on it. I'm a little news obsessed. I can't help it! I got out that book from the library too - I think that I only made an easy salad, but was intrigued by the salmon, so maybe I'll take it out again. Thanks for the piglet tip - FYI, Freddie Prinze Jr is a judge. As is Lena Dunham. REALLY!?! HUH???? Is the Piglet becoming reality internet? I'm happy to spend the seven minutes with your voice, thoughts, and imaginings. Your blog is always a pleasure to read and I'm grateful for it. Have you encountered Jade Claws and Phoenix Trees, a fabulous book about Chinese cooking techniques? 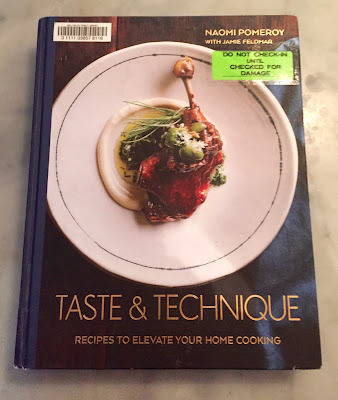 It's way too meat-centric for me, but I gave a copy to a Chinese American friend who is a tremendous cooking geek and he was immediately in love with it. Piglet is my favorite Feb event! Thanks for covering. I am grateful to you for sharing your life with us this way so generously. Thanks! Your coverage of piglet last year was what introduced me to Food52! Its been a great relationship since:) Also you would make a fantastic judge for it. Next year perhaps? Been so thoroughly enjoying spending my time with your voice, thoughts, and imaginings in my head. Really a treat! I count on you every year to notify me when the Piglet is happening! So, thanks for that. And I agree with a couple of other points above: 1) I have spent probably quite a few hours on your writing, including the book (when are you going to write another book, Jennifer? ), and 2) the idea of green beans poached entirely in oil sounds, well, very oily. You say that was okay? It's hard to imagine. I have had to go to a policy of consuming news on my own schedule. Believe me, I consume a lot of news. But I am trying to consider whether or not I have time or energy at that moment to HANDLE the news before automatically checking email/Facebook/Washington Post/whatever. That is working better. Also: no multiple tabs open on the computer. Making that last rule has changed my life and made me feel so much calmer. ! Thanks for letting us into your world! Rolex has never been Replica Rolex Watches the kind of company that makes rash design decisions (okay, maybe it did with the Explorer II ref. 1655), and the Rolex Daytona is no different. With two predominant designs in its half-century lifespan, Hermes handbags it has been more a matter of evolution rather than revolution for the famous sports chronograph. Patek Philippe replica watches Starting with the ref. First, Pakar SEO write for humans. It’s not robots that you care about getting to your website and influencing, Pakar SEO Jakarta it’s people. So, you have to write for them. That means, you write like you talk to people and you write about what people want to know. If someone in real life were to ask you a question, you would answer it right? Well, on the internet, it’s the same deal. So, write down the questions people might have, and then answer them. I’ve seen this work over and over for businesses. For example, Marcus Sheridon Pakar SEO Jakarta built his fiberglass pool company using SEO and inbound marketing. His company went from being just another local pool company to the #1 website on the internet for fiberglass pools. He did it by simply answering customer questions on the company website Nasional. He has made millions of dollars in sales from the leads his website generates. It all starts with the simple idea “they ask, you answer”. Jakarta Pakar SEO Jakarta If a customer asks a question, Pakar SEO Jakarta he writes it down and creates a page on his website to answer that question Indonesia . Ahaa, its fastidious discussion on the topic of this post at this place at this webpage, I have read all that, so now me also commenting at this place. It is the best time to make a few plans for the future and it's time to be happy. I have read this put up and if I may just I want to counsel you some attention-grabbing issues or tips. Perhaps you can write next articles relating to this article. I want to read even more issues approximately it!